We produce quality tasting pork, poultry, and eggs through humane and natural husbandry. We maintain the highest integrity in raising, processing, and selling a premium product to insure your satisfaction so that you become a promoter of Sunny Cedars Farm. We're purveyors of delicious, heritage breed meats raised the slow, old fashioned way, without the use of therapeutic antibiotics or hormones. The animals have enough room to live comfortably and stress-free. Their lives sustain and bring us pleasure, so we always give them our care and respect. Our packing house is certified humane slaughter and puts the animals to sleep before they are processed. We're a small family farm and we direct market our meats and eggs from our family to yours. We sell from the farm and at several farmers markets. 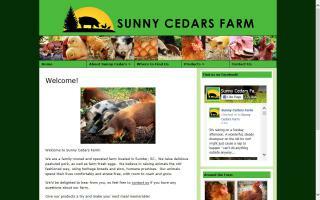 Try some Sunny Cedars eggs & meat today and taste the difference!